Are you planning to participate in a language exchange? If so, living options have definitely crossed your mind. In this post, we will discuss different possibilities for you to live in your desired destination abroad. There are many options available, each with its benefits and disadvantages. However, through this post you will be able to explore and figure out which is the best living option for you! This is probably one of the best options for someone who seeks true culture and language immersion as well as a cheaper price. It is also one of the most common options for language exchange. MyHOSTpitality is an organization that allows you to organize your own cultural and language experience in a simple and economic way. Through their online community, you can sign up as a guest and find a native family to live with during your stay. The host-guest model is made up of a guest teaching his host his native language in exchange for free accommodation in the host’s home. MyHOSTpitality guarantees linguistic immersion by having the host and guest agree on the number of hours they will practice the guest’s native language. The rest of the time you can speak the host’s native language to better your language skills. This option would not be good for someone who enjoys isolation; however, why bother travel if you will be alone the entire time? The best way to maximize your opportunities to learn a language is to interact with as many locals as possible during your stay! The next living option during your language exchange is a residence. This is a good option for students who enjoy living in close proximity to other students. Most residences give you access to different zones, such as the laundry room and the common room with games. You can also easily walk down the hall to see a friend. Residences are typically international living settings so you can easily meet people from all over the world who, like you, are interested in learning Spanish. It is a great option for someone who enjoys having easy access to an international group of people. However, because the residence is so multicultural, it can be hard to reinforce your learning of one specific language. Typically, you will interact with the people in your residence in English, as that is a widely spoken and understood language. If deep linguistic immersion is your goal while you are abroad, a residence might not be the best option. How ever, if meeting people from all over the world is your main goal, a residence is a better living choice. A hostel is much like a residence. A key difference is that it is made up of more than just students. 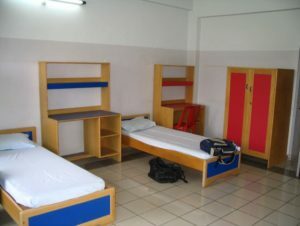 Many of the students who stay here are traveling but there is no guarantee of who will be staying in the hostel. This allows you to meet people of all ages from all over the world. 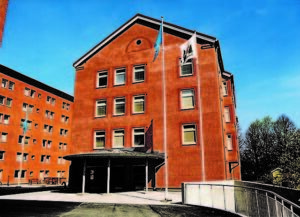 One advantage and disadvantage of a hostel, depending on your point of view, is that they tend to be much less stable in terms of their population. People typically stay in a hostel for short periods of times so during your stay you can meet many people; however, you they might be very short and superficial friendships. While participating in your language exchange you can also be in a hotel, studio, or apartment. This gives you your own personal space. You have the ability to do as you please without having to follow anyone’s rules. These are better options for someone who plans to be abroad for a longer period of time. Although it can be nice to live by your own rules while you are abroad, a hotel, studio, or apartment is a more isolated option. You would not have someone to interact with daily at home to practice the language you want to learn, unless you travel with a friend and stay together. And even so, this does not guarantee true linguistic immersion. If your friend is not a native speaker odds are you would not be taking as much advantage of your learning opportunity abroad as you could be. You could also find someone in abroad to stay with, but this can be a risky choice because you are not familiar with his living habits. If you have a friend in your destination abroad, you could consider staying with him. This could help you reduce your living costs significantly. Just be sure to communicate this to the organization you are studying through beforehand. One disadvantage of staying with a friend is that you might catch yourself speaking your native language sometimes as opposed to the language you are trying to learn. However, if you and your friend are determined, you can use your friend’s native speaking skills to improve your own language skills! Now that you have been exposed to different options of living abroad for your language exchange, you can look at the advantages and disadvantages of each to see which is the best fit for you. Good luck with your language exchange program!